Christopher Nolan and Jonathan Nolan . A team of explorers travel through a wormhole in an attempt to ensure humanity's survival. 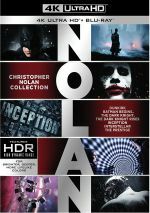 For his first effort after the conclusion of the Dark Knight Trilogy, Christopher Nolan turned his eyes toward the sky. 2014’s Interstellar provides an epic that looks at space travel and human survival. After blight ruins massive amounts of crops, famine kills billions worldwide. As it becomes clear that life now seems unsustainable on earth, the remnants of NASA works on two potential solutions to save humanity. For one of these, Professor John Brand (Michael Caine) works to create a way for a massive space station to launch via gravity. If that fails, astronauts pursue “Plan B”, and we follow their exploits. In the past, scientists used a wormhole to explore potentially habitable worlds far from our galaxy. Led by former NASA pilot turned farmer Cooper (Matthew McConaughey), a team follows up on three potential worthwhile planets. We trace their efforts and all the problems they confront – as well as continued efforts with Professor Brand and Cooper’s daughter Murphy (Jessica Chastain). We first meet Murphy as a 10-year-old (Mackenzie Foy), but due to the relativity of time, she gets decades older while her father stays the same age. Despite her continued anger due to her father’s alleged abandonment, she uses her talents to help Professor Brand work toward a solution. Like Nolan’s prior flicks The Dark Knight and The Dark Knight Rises, Interstellar made ample use of full IMAX photography. With about 66 minutes of that footage, it shined on the huge IMAX screen. I saw Interstellar theatrically three times because I so love the full IMAX presentation. After my first screening, though, I didn’t think I’d even want to view it a second time. I took in Interstellar opening weekend in November 2014 and can’t say I felt wild about it. While I enjoyed it, it didn’t floor me as Dark Knight and Rises had. Nonetheless, I found the siren song of IMAX hard to resist, so I went back early January 2015 – and then again late February 2015. I liked the film more during the second go-round, so I figured a third screening made sense, and I enjoyed it even more after that third take. At this point, I don’t think Interstellar quite competes with the Dark Knight films, but it works better than anything else in Nolan’s canon. On the surface, however, Interstellar probably should falter, as it comes with a bunch of potential negatives. For one, the movie often seems like a conglomeration of influences, and it doesn’t take much to recognize these. We can easily detect signs of 2001: A Space Odyssey, Close Encounters of the Third Kind, Contact and The Abyss, among others. While I don’t think these allusions overwhelm, they can make the movie look less than original at times. To the general public, it probably doesn’t help that Interstellar came so soon on the heels of 2013’s Gravity. Storywise, the two share few similarities, but both take place largely in space, and that makes them look alike in a superficial way. Interstellar comes with no Gravity influence at all, but some may view it as a copycat. In addition, Interstellar comes with a moderately messy plot that occasionally gets bogged down by time travel paradoxes. I won’t spill beans – I like to avoid spoilers – but some of the events encounter issues similar to what we saw in 1984’s Terminator. In that film, John Connor sent Kyle Reese back in time to protect John’s mother Sarah. During Kyle’s trip to the past, he impregnates Sarah with the baby that becomes John – which means the adult John from the future shouldn’t have existed to send Kyle back in time, right? Issues like that occur in Interstellar, and they can distract. Actually, the more I saw the movie, the less I viewed these issues as true paradoxes, for I was able to semi-sorta construct a logical explanation in my head. However, my notions still require a certain leap of logic - which remains true for virtually all movies with time-travel elements, so I shouldn’t fault Interstellar too much. Especially since Interstellar does so much right. If nothing else, the sheer spectacle of the film amazes. Of course, some of that impression comes from the format in which I watched the movie those first three times, as nothing tops true IMAX for stunning cinematic visuals. Even on my much-smaller TV, though, the breadth and depth of the tale impresses. Interstellar presents a true epic, as it delivers a dazzling view of space flight and different worlds. The movie uses impeccable effects along with a good sense of “nuts and bolts” to create an exciting take on these areas. Like Nolan’s other movies, though, Interstellar doesn’t just come with a visual and action impact – it also packs a good emotional punch. At its heart, the film focuses on the relationship between Cooper and his kids, with an emphasis on Murph. This side of the film allows it to become more than just amazing eye candy. We see the sacrifices Cooper makes and those add human impact to the proceedings. Interstellar backs up its visual splendor with a compelling emotional tale that keeps us involved. Most movies become less interesting with additional viewings, while a few gain stature. I’ve now seen Interstellar many times, and I still love it. The film delivers a stunning technical achievement backed with heart and meaning. It’s the best movie of 2014 – and by a pretty wide margin, as none of the others can compete with its scope and impact. 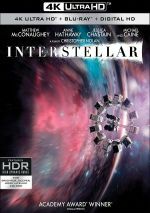 Interstellar appears in an aspect ratio of approximately 2.35:1 on this 4K UHD Disc – most of the time. The filmmakers shot about 40 percent of the movie with IMAX cameras, and that used a ratio around 1.43:1. For those scenes, the 4K UHD expands to 1.78:1; it’s not the full IMAX image, of course, but it’s closer than 2.35:1. Unsurprisingly, the IMAX shots fared best, as they looked simply amazing. The 2.35:1 material also fared well, so don’t expect notable degradation, but you should anticipate improvements for the IMAX material. This meant impeccable sharpness throughout the movie. At no time did any softness interfere, as all shots seemed tight and concise. Shimmering and jaggies remained absent, and I noticed no edge haloes. Print flaws also failed to appear. In terms of colors, Interstellar tended toward a teal and orange feel. These tints seemed fairly gentle, though, so they didn’t overwhelm. A lot of white came through as well during space shots and on other planets, and overall, the colors appeared well-rendered. Blacks were deep and rich, and low-light shots were fine. A few low-light shots offered a smidgen of thickness, but that stemmed from the source. Overall, this became an outstanding visual presentation. Expect equal pleasures from the amazing DTS-HD MA 5.1 soundtrack of Interstellar, as it used the channels in a dynamic manner. The film created a sense of location and action that involved us well, with material that seemed well-placed and engaging. This proved true for scenes quiet and loud. During softer sequences, the track still put information in the speakers to create a good feel for the environment. Louder sequences went hog-wild, as they immersed us in the action to a terrific degree. Space elements worked best, of course – such as during the launch – and the track filled the spectrum with a realistic sense of the situations. Audio quality also satisfied. Music was bold and full, and effects followed suit, as those elements came across accurate and dynamic. Speech seemed natural and concise, as even looped lines matched the material well. Bass response appeared tight and warm. This was the kind of soundtrack for which you spent a lot of money on a home theater – it packed a terrific sonic punch. How did the 4K UHD compare to the Blu-ray version? Audio remained identical, as both offered the same DTS-HD MA 5.1 soundtracks. Visuals showed improvements, though, as they demonstrated better delineation, colors, blacks and general impact. As great as the Blu-ray looked, the 4K topped it. 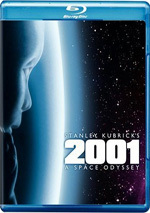 The 4K disc includes no extras, but the package provides bonus Blu-rays. The film appears on Blu-ray One, so all of the movie’s extras reside on a second disc. Narrated by Matthew McConaughey, The Science of Interstellar runs 50 minutes, 20 seconds and provides comments from producer/Californian Institute of Technology astrophysicist Kip Thorne, writer/director Christopher Nolan, writer Jonathan Nolan, producer Emma Thomas, NASA Ames Research Center mission scientist Natalie Batalha, CIT theoretical physicist Sean Carroll, visual effects supervisor Paul Franklin, UCLA astronomer Andrea Ghez, CIT astrophysicist Fiona Harrison, CIT physicist Jamie Bock, UCLA geographer Greg Okin, former NASA astronaut Marsha Ivins, and SpaceX founder Elon Musk. As implied by the title, this documentary tells us how Interstellar uses and reflects real-life science. This show works best if you’ve already seen the movie, of course. It brings us a nice overview of these areas and allows us to connect them to the film. Under Inside Interstellar, we find 14 featurettes with a total running time of two hours, one minute and 55 seconds. These include “Plotting an Interstellar Journey” (7:49). “Life on Cooper’s Farm” (9:43), “The Dust” (2:38), “TARS and CASE” (9:27). “The Cosmic Sounds of Interstellar” (13:40). “The Space Suits” (4:31), “The Endurance” (9:24), “Shooting in Iceland” (12:42), “The Ranger and the Lander” (12:20), “Miniatures in Space” (5:29), “The Simulation of Zero-G” (5:31), “Celestial Landmarks” (13:22), “Across All Dimensions and Time” (9:02) and “Final Thoughts” (6:02). Somewhat annoyingly, there’s no “Play All” option for these. Across the programs, we get notes from Christopher Nolan, Jonathan Nolan, Thomas, Thorne, Franklin, Ivins, producer Lynda Obst, production designer Nathan Crowley, director of photography Hoyte Van Hoytema, executive producer Jake Myers, Sears Ranch’s Rick Sears, unit production manager Daniel M. Stillman, greens supervisor Dan Ondrejko, stunt coordinator George Cottle, SFX supervisor Scott Fisher, special effects foreman Troy Dederick, stuntman Mark Fichera, composer Hans Zimmer, editor Lee Smith, organ soloist Roger Sayer, costume designer Mary Zophres, first AD Nilo Otero, welder John Kelso, New Deal Studios VFX supervisor Ian Hunter, assistant pyrotechnician Douglas Ziegler, and actors Casey Affleck, Topher Grace, Jessica Chastain, Bill Irwin, Wes Bentley, David Gyasi, Matthew McConaughey, Michael Caine and Anne Hathaway. “Inside” examines the movie’s origins and development, story/character/screenplay areas and the emphasis on real science. From there it looks at visual design and photography, inspirations and influences, sets and locations, stunts and action, various effects, cast and performances, music and editing. After this we hear about costumes, faking gravity-free situations, the depiction of space, and valedictory sentiments. While I’d prefer a more fluid documentary overview, “Inside” still manages to offer a lot of good insights about the film. It covers a broad array of subjects and does so with reasonable clarity and depth. 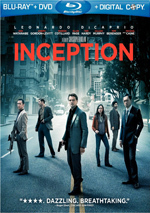 The featurettes manage to tell us a fair amount about the movie’s creation. Four trailers complete the package. We see one “teaser” and three ”theatrical” ads. Few – if any – modern filmmakers “think big” to the level achieved by Christopher Nolan, and Interstellar once again demonstrates his ability to succeed with his grand efforts. Probably his best non-Batman film, Interstellar delivers a vivid, emotional and ambitious space epic. The 4K UHD delivers stunning picture and audio along with a fairly involving set of supplements. Interstellar remains an excellent film that fares exceedingly well on 4K UHD.